The cost of energy from utility scale solar plants are a fraction of what they were a decade ago. If you think of solar power, you probably think of large, shiny black rectangles on house roofs. Using a photovoltaic system to supply your personal power needs doesn’t just appeal to people’s environmentalism — it also appeals to rugged individualism. By producing their own energy, homeowners no longer have to rely on the grid. But solar power doesn’t mean disconnecting from the shared energy supply. In the future, people who don’t have a roof-mounted solar system might use solar-generated power anyway — thanks to utility-scale solar. In 2007, there wasn’t so much as a toaster in the United States that was powered by a large-scale solar power plant. Today, hundreds of solar farms power homes and businesses. The second quarter of 2016 was the 12th quarter in a row in which utility photovoltaic plants added an energy capacity of at least 500 megawatts, according to the Solar Energies Industries Association. An increase in solar panel plants is encouraging — and there’s much more currently in development. The contracted utility pipeline is more than three times those 12 quarters combined: 21.4 gigawatts. 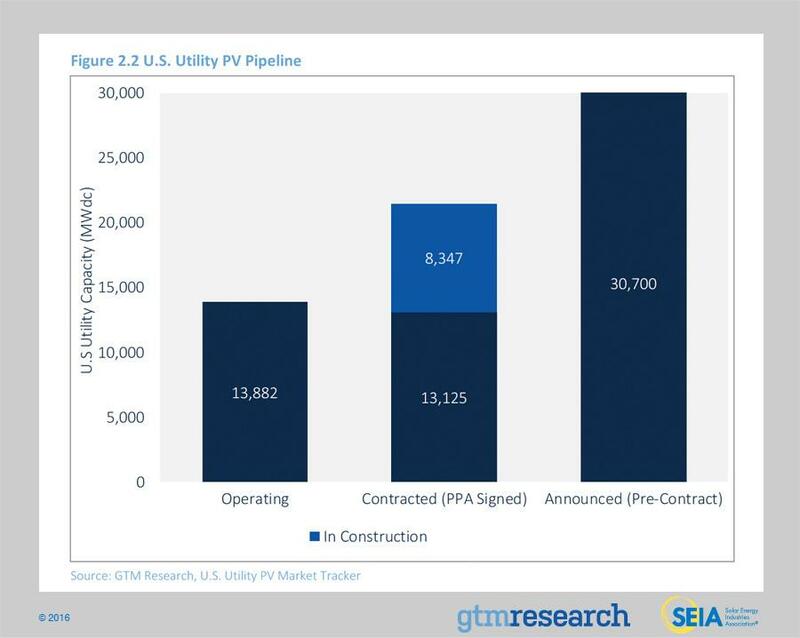 On top of that, 30.7 gigawatts worth of utility solar projects have been announced (although they don’t yet have a signed contract). All of that growth (and potential growth) sounds nice. But do we have any reason to believe that the projections will actually match how much energy these solar farms will pump into the grid? As a matter of fact, we do. Earlier this year, researcher Mark Bolinger at UC Berkeley published a study that tracked the performance of utility-scale solar projects. Specifically, he looked at 128 projects in 18 different states and measured their performance from 2007 through 2013. 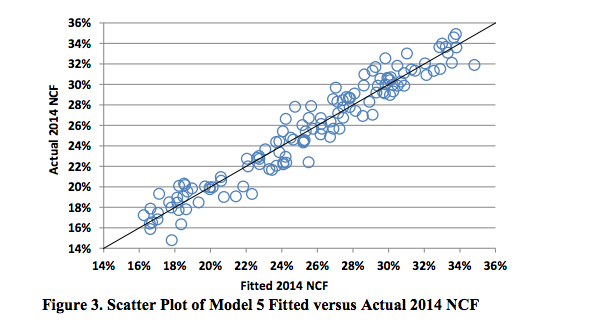 Then he checked them against the “fitted” capacity factor (i.e. the capacity factor as projected by statistical models). The result? Energy capacity is growing as much as analysts believed it would. Here, capacity refers to the total amount of energy that solar plants can theoretically generate in an hour at peak performance. Obviously, solar power plants can’t always perform at their peak (for example, they don’t generate energy at night), but that figure still provides a good indication of the capabilities of the solar farms. This gets a little more confusing when you note that this is different than capacity factor. Capacity factor refers to how much energy actually produced, in the real world. This graph shows the how close reality is to projections. The black line is the statistical amount projected, while the blue circles in the scatter graph represent the actual capacity factor. The total volume of solar plants isn’t just just increasing: the size and scope of individual projects are also getting more ambitious. Right now, the jewel of big solar in the United States is the Solar Star in Rosamond, California. At 579 megawatts, it is the world’s second largest solar farm in terms of installed capacity. (The world’s largest is the Longyangxia PV/Hydro power project in China.) Tied for third place are the Topaz Solar Farm and the Desert Sunlight Solar Farm, both of which are also in California. Solar Star, and other solar projects in the state, is designed help put sunny California on the track to satisfy the requirements of the Renewables Portfolio Standard (RPS). This is a policy that requires 33% of the state’s electricity to come from renewable resources by 2020, and 50% by 2030. While that’s all very exciting, none of that will matter if it can’t meet the demands of the energy marketplace. While producing energy with low carbon emissions is a noble goal, the price of energy will be the deciding factor in whether or not it grows. There’s more good news here. The price of utility solar energy from new solar projects hasn’t just decreased — it’s a small fraction of what it was about a decade ago. While the price in 2007 rose above an unreasonable $200/MWh, it fell sharply, decreasing by $20 to $30/MWh per year through 2013. In 2014 and 2015, it fell to roughly $10/WHh per year. According to the most recent data, most locations can get utility solar power at under $50/MWh. It’s even around $30/MWh in some parts of the country. This isn’t quite cheap enough to be a strong competitor with existing gas-fired power plants. However, these numbers are beginning to look promising when they’re compared to the cost of energy from a new gas plant, which weighs in the costs of building the plant. 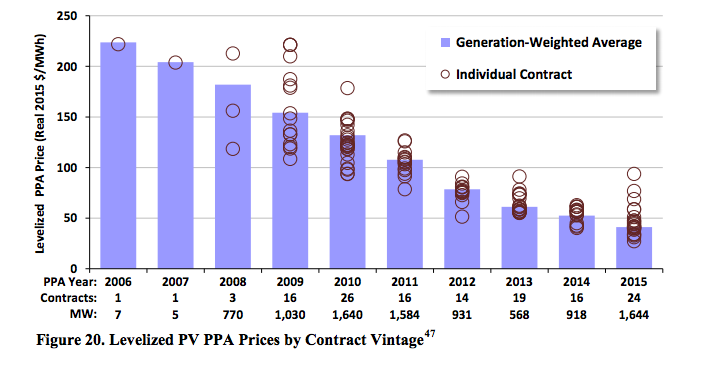 The price of solar does have one major advantage over the price of gas: stability. While fossil fuels are cheap, their prices are highly unstable, and may increase due to changes in the market or political changes. The raw materials of solar power, solar rays, are reliable, free, and predictable. Consequently, the price of solar power is nowhere near as volatile as fossil fuel — which might give it a leg up for policymakers and consumers. Over the past decade, utility solar went from an overpriced novelty to a rising star in the energy world. Capacity has steadily increased for years, and the industry is only getting started. Even better, capacity factor has matched projections, which means that investors will feel comfortable pouring more money into new projects. At the same time, the price of a MWh from a large-scale solar project has slashed — and it gets more affordable every year. In short, large-scale solar power is primed to reach its tipping point in a matter of a few years. Right now, one of our primary motivations for switching to large-scale solar is because it’s good for the planet. But soon, we’ll want to switch because it’s the best option for the bank accounts of energy consumers. "The price of solar does have one major advantage over the price of gas: stability. While fossil fuels are cheap, their prices are highly unstable, and may increase due to changes in the market or political changes."